At first blush, Birmingham, Ala., may not seem the first place you would want to set a gothic horror story. Its red-clay foothills and dormant smokestacks, surrounding a bustling, New South medical district, suggest something else. But Caitlín R. Kiernan says she couldn't have set her debut novel anywhere else.
" 'Silk' is as much a novel about Birmingham as it is a novel about anything else," Ms. Kiernan says. "I couldn't possibly divorce the characters and the story from the place. Setting is too integral. And I think Birmingham is at least as haunted as New Orleans or London or any other place that might be considered a better or easier setting for dark fantasy." 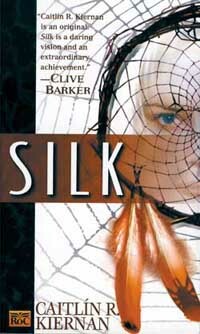 In "Silk," which was first published last year and is available in paperback, several troubled young people find themselves drawn into the circle of one Lila "Spyder" Baxter, owner of a shop called Weird Trappings, where one can buy anything from Kool-Aid-red hair dye to rubber monitor lizards. Unfortunately, Spyder, who has taken the eight-legged variety of her near-namesake as her totem, has troubles of her own. She dreams of an Apocalypse than never quite happened and worries over things she thought long buried. And some of those things may be stalking her friends. Ms. Kiernan is at something of a loss when describing her book to those who have yet read it. "I can't. I've tried," she says. "A friend of mine in Athens, Ga., called it a gothic 'Charlotte's Web.' There is some truth in that, as long as you keep in mind there are no pigs in 'Silk.' "
There are, of course, lots of spiders. Nevertheless, "Silk" has earned its author praise from horror and dark-fantasy novelists like Peter Straub, Clive Barker, Neil Gaiman and Poppy Z. Brite, to whom Ms. Kiernan is often compared. "Never mind that mine and Poppy's writing is nothing alike, or that she has gone out of her way to distance herself from goth," she says. "It's just the way things are. People seem to like us in the same shoebox. Fortunately, we play well together." In fact, Ms. Kiernan and Ms. Brite are friends. They even share the same Web site, Pandora Station, at www.negia.net/~pandora. And Ms. Kiernan also has her own Internet discussion group, alt.books.cait-r-kiernan, where she mingles with her growing number of fans, some themselves authors. "The reaction (to 'Silk') has been better than I ever expected," she says. "Seeing the Charles de Lint review (in The Magazine of Fantasy and Science Fiction) was terrific. I was in L.A. right after it came out and Harlan Ellison actually called to ask if I'd seen it. That's been one of the high points of doing 'Silk,' getting that sort of feedback from authors that I've admired for so long." Among her literary influences, she counts James Joyce, T.S. Eliot, W.B. Yeats and William Faulkner, as well as genre writers like Ellison, Straub, Ray Bradbury, Shirley Jackson, Angela Carter, H.P. Lovecraft and William Burroughs. "A pretty diverse bunch," she says. Of course, 'Silk' isn't Ms. Kiernan's only work. Her numerous short stories have appeared in magazines and anthologies. More than 30 of them will be collected next year in two anthologies: "Tales of Pain and Wonder," which is due to be published in February, and "From Weird and Distant Shores," due out later in 2000. Three of her stories are already collected in her chapbook, "Candles for Elizabeth." Although she has lived most of her life in Birmingham, Ms. Kiernan was born in Dublin, Ireland. Before turning to writing in 1992, she studied vertebrate paleontology at The University of Alabama in Birmingham and the University of Colorado, Boulder. She is still doing some research out of Columbus University in Georgia and is a member of the Society of Vertebrate Paleontology. She says, "For me, paleontology has always, since I was a small child, been the most wonderful, most fascinating thing I could imagine. I mean, here's the entire history of life, as we can know it at the moment, waiting to be discovered, to be pieced together from tantalizing bits and pieces dating back over the last four billion or so years. What could be more spectacular?" She also spent about seven months as the vocalist for the goth rock band Death's Little Sister, but she gave that up when her being a full-time writer started to conflict with her being a member of a working band that needed to tour and record. Gaiman, introducing Ms. Kiernan's short-story contribution to his and Ed Kramer's "The Sandman Book of Dreams," describes her as "a tall, elegantly gothic lady, who looks good in green velvet, and how many of us could dare to make that claim?" For that matter, how many writers would try to follow-up Gaiman, whose 75-issue comic-book series, "The Sandman," is the only comic ever to win the World Fantasy Award and almost single-handedly turned comics into respectable literature? Well, Ms. Kiernan is trying. She is currently the writer of "The Dreaming," published by the Vertigo imprint of DC Comics. After she had contributed to "The Sandman Book of Dreams," Gaiman suggested her as a contributor for "The Dreaming," which started out as an anthology title. "He called me and said something like, 'I'm sure you have better things to do than write for comics,' and I said, 'Are you kidding?' I was such a fan of 'The Sandman' I think I would have done that first story, 'Souvenirs,' for free," Ms. Kiernan says. "Anyway, I said that I'd love to do it, even though I'd never seen a comic script and had no idea how to write one." After the success of Ms. Kiernan's first story, she was asked to contribute a second, "Unkindness of One." 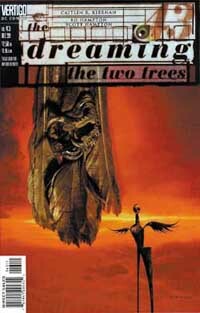 And not long after "The Dreaming" moved from an anthology format to having a set creative team (issue No. 35), she was named the comic book's full-time writer. Issue No. 43, which wraps up Ms. Kiernan's first major story arc on the title, is on newsstands now. "I don't have an end in mind for "The Dreaming," she says. "I think there will be a time when I do, perhaps in another couple of years. It isn't something I think should go on forever. But I still have a lot of stories left to tell in that world." Ms. Kiernan's other comic-book work includes a four-issue mini-series, "The Girl Who Would Be Death." Meanwhile, in addition to trying to stay well ahead of her "Dreaming" deadlines, Ms. Kiernan is working, slowly, on her second novel, "Trilobite." "The publisher was very, very happy (with 'Silk')," she says. "I think their only real disappointment has been that the second novel is taking me so long. Honestly, it's hardly even begun. I don't think I'm going to be the sort of author who puts out a novel a year." Of "Trilobite," Ms. Kiernan will only say, "that it's also set in Birmingham, that it isn't a sequel to 'Silk,' and, with any luck, it might be finished this time next year."